Students are responsible for knowledge of, and adherence to, all university requirements and regulations. Students are responsible for knowing the degree requirements for their major and enrolling in courses that meet those degree requirements and regulations. Students are responsible for seeking information and assistance from appropriate staff should they have any questions regarding requirements or regulations. the ability to communicate scholarly thought to professional colleagues through writing and discussion. These general learning outcomes are in addition to program-specific learning outcomes. A study plan is an agreement developed in collaboration with an academic advisor for a student's degree completion at GSU and informs the student of the recommended sequence of required courses. Every degree-seeking student is required to develop a student study plan for the major during the first term of enrollment. Students who do not complete a study plan during the first term of enrollment may be precluded from further registration as degree seeking students, until a study plan is completed. The student study plan for the degree sought will detail the requirements which are in effect at the time of admission as a degree-seeking student. These requirements will remain unchanged as long as a student's enrollment in the program has not been interrupted by more than three (3) terms, unless substitutions need to be made due to curriculum change. The study plan will specify the amount of transfer credit, proficiency credit, and credit for experiential learning applied toward the degree requirements; the total credit-hour requirements for the degree; and required and elective courses. After admission into a degree program, a new study plan must be developed and approved with the academic advisor when a student applies for acceptance of additional transfer credit from another regionally accredited institution, or seeks modification to the study plan. When a student changes majors or is readmitted, a new study plan must be developed and approved with the new academic advisor. Students are encouraged to contact faculty members in specific discipline areas in which they have interests for additional academic advisement. Students choosing to take courses not specified in their study plan may find that such credit may not apply toward the degree requirements. Doctoral students who maintain a minimum cumulative grade point average of 3.0 are in good standing. 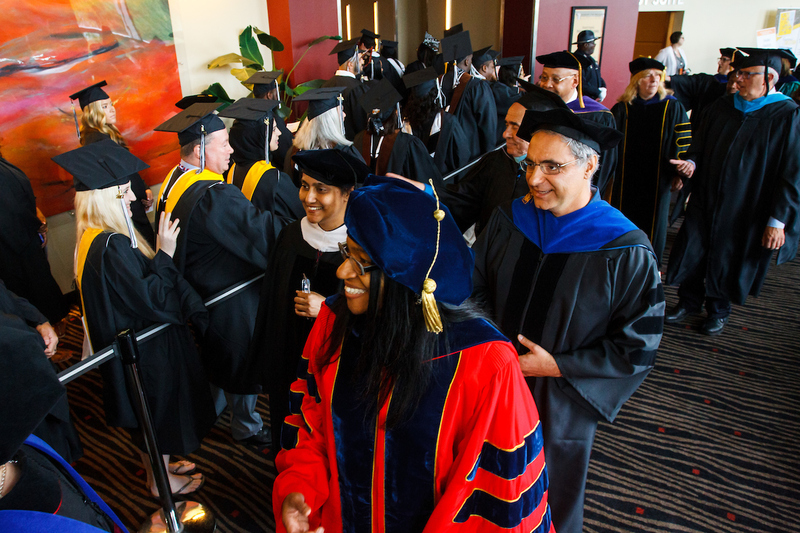 All doctoral students are required to earn a minimum of 24 credit-hours of course work from Governors State University before the award of the doctoral degree. In addition, all doctoral students must meet program residency requirements, which are more stringent, as defined by the curriculum displays before the award of the doctoral degree. Students should arrange to meet with their assigned academic advisors to review the student study plan and verify expected completion of degree requirements. Students must apply for graduation by the published deadline. Students should complete both an Application for Graduation form and a Student Progress Report form, available on the web or in the Registrar's Office. The application is approved by the advisor, division/department chair, and dean. Approval by the Registrar's Office results in degree certification and awarding of the diploma. A $125 graduation application fee covers costs of diplomas and commencement. Commencement is held once a year. Participation is optional. Participation is available for students who have completed their degree requirements during December of the previous year, as certified by the Registrar. Students on track to complete their requirements in May or August of the current year may apply to participate. Students with any unpaid financial obligation to the university are not eligible to participate. Participation in a commencement ceremony does not constitute certification of degree completion. All participants must be certified by the Registrar before receiving a degree. Diplomas are awarded only upon verification of completion of all degree requirements and satisfaction of all financial obligations to the university. Diplomas are inscribed with the type of degree, major, date, and the student name on record at the time the degree was confirmed.